at first did not fit in at all. But soon, under the guidance of Highfather, Orion's brutal and unruly self was calmed, and over time, a more mature and almost philosophical warrior emerged. When he learned that Darkseid was his true father (a happening that Darkseid hoped would return Orion to his side), it only strengthened Orion's hatred toward Darkseid and his determination to destroy him. In the recent past, Orion has been deeply affected by the evil of his father Darkseid. 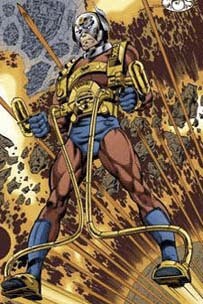 The first came when after he and Darkseid had entered the Source, Orion killed him there. Over time, the death of Darkseid greatly affected all of the New Gods, as his death in the Source had tainted it, causing New Gods to kill their fellow New Gods on New Genesis. Not onyl that, but Orion's demeanor became more and more brutal, until the truth arose: Darkseid has somehow become part of his son, and he soon split from his son (quite literally) to become his own self once again. Not longer after this, Orion was seemingly killed by Desaad on Earth; however, Orion, on his way to becoming one with the Source, managed to take Desaad with him. Soon after, Highfather was able to extract Orion from the Source; but again, this Orion seemed more evil and savage than before. Upon confronting the Female Furies, who were trying to invade New Genesis, their leader Bernadeth seemed to almost recognize Orion as someone else. After both Highfather and Darkseid realized something was wrong, Highfather, along with Takion, was able to vanquish the evil spirit within Orion: it turned out that Desaad has been fused with Orion since they entered the Source together. Orion remains a valiant warrior, and now seems determined to end his father's madness once and for all. He finally did so in the fire pits of Apokolips. Despite the claims by his mother Tigra that Darkseid may not actually be Orion's father, he set out to one day fulfill the prophesy the Source Wall gave him years before. Following her death at the hands of a crew of Darkseid's Suicide Jockeys, Orion swore revenge, which he got when, after a brutal battle before the populations of both New Genesis and Apokolips, he deflected Darkseid's Omega Beams, which reduced his father to a pile of ash. Weapon of choice: his brute strength and his astro-glider, which allows him to fly through space and use the "astro-force" as a weapon.